Unlock Samsung Galaxy Ace Plus S7500 - Safe IMEI Unlocking Codes for You! Unlock Samsung Galaxy Ace Plus S7500 Handset! In case your Galaxy Ace Plus S7500 doesn't ask for the code and there is no designated field to enter it, please DON'T PLACE ANY ORDER, contact us first for support. Are you looking to unlock your Samsung Galaxy Ace Plus S7500 mobile phone to use it with Any GSM SIM Card worldwide? If yes, do it know with our Samsung Unlocking Service! The process is easy and 100% Guaranteed to unlock your smartphone! As soon as you receive the Unlock Code (8 digit Network code) and easy to follow instructions, your Samsung phone will be unlocked in less than 2 minutes! Here is The Complete List of Phones! How to Unlock Samsung Galaxy Ace Plus S7500 Phone - Tutorial! 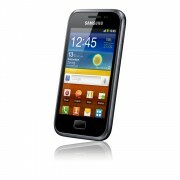 Please find bellow a step-by-step guide to follow in order to unlock your Samsung Galaxy Ace Plus S7500 mobile phone. NO technical skills required! In case your phone doesn't ask for the code and there is no designated field to enter it, please write us. Can you provide code for Samsung Galaxy Ace Plus handset from fido Wyoming ? I got my Samsung Galaxy Ace Plus from USA and I'm in England right now temporarily so what should be the country that I will send to you? do you offer discount in case I'll request 3 codes for different phone models? Hi Rob! Yes, in your case we have discounts and giveaways available. Please email us for more details. Thank you! Do you have available codes for Samsung Galaxy Ace Plus S7500 ? Hi Dion! Yes, the codes are available for your device. Please use the form to see all the details. Thank you!